The characters below are a few of my favourites. If they are of any interest to you, feel free to PM me! It should be noted that these are not the only characters I have. I have a plethora! And whatever I don't have a character for, I'm more than willing to create. Some of my fandoms can be found on my profile. As always, I'm always up for a message tossed my way if you have any questions. My updated 1x1 interest check can be found by clicking here! Inventory: Headphones, Mp3 player, notebook (pen included), oversized jacket, wallet (with identification and credit cards), cellphone, small wallet-sized booklet of photos including his mother, father and twin brother. Skills: Kazume is an avid hiker and enjoys both sketching and writing while he hikes (often for hours), he finds himself mapping his routes quite precisely. He is keenly adept at both foraging signatures and lock-picking. Both skills comes from a shady past he has decidedly left behind. Personality: Kazume is a quiet individual. He prefers to observe others before jumping into a conversation and this makes him appear cold or standoffish. He is genuinely interested in what others have to say and while he doesn't tend to articulate it, he believes everyone should have their voice heard. Kazume can be quick tempered and is easily frustrated in some situations. He is a traditional introvert and enjoys his time alone. Once he is more comfortable with people he typically resorts to snarky comments and can seem uncouth, or even argumentative though it's very likely that he's typically just being playful. Fun Facts: Meketre is an incredibly huge fan of Captain America practically worshipping everything he does. She has worked closely with Clint Barton and keeps in close contact with him having cultivated a good friendship with the archer. Storm acted as a mother-figure for Meketre when she was a young child. Wolverine helped her to learn boxing as a teen. And will correct her form when she returns to the mansion. Powers and Abilities: Umbrakinesis; complete control to shape and manipulate darkness and shadow. Meketre can use it in a transparent way or make the darkness physical, forging weapons and doubles. She became aware that it wasn't actually traditional umbrakinesis that she had control of but actually, the darkness comes from a form of cosmic manipulation. Meketre can create, shape and manipulate cosmic energies to produce nearly any effect; including molecular restructuring and transmutation of matter (this effect only works on herself, nothing else), the creation of force fields (very small, and often times weak), the creation of inter-dimensional portals and vortexes, and cosmic awareness on a universal scale which translates into an empathic ability around human beings. Strengths: Deep empathy for the emotions of others and because of this, Meketre is excellent in picking out when someone is lying. A resistance to telepathic assault. Has a cosmic form which can deflect or absorb a number of various energy-based attacks. Weaknesses: Distracted by major cosmic events (supernovas, vast emotional disturbances such as a world dying, wormhole shifts, etc.) which results in long moments of day-dreaminess. 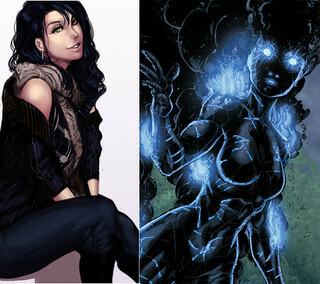 Meketre is not immune to telepathy in full though she is resistant. Prolonged use of her cosmic form results in large scale physical weakness and mental fatigue. *I do not own this artwork, it comes from a collection of saved pictures over the years. At the artist's request I will credit or remove it!